it's Christine, bringing you another video-tutorial. 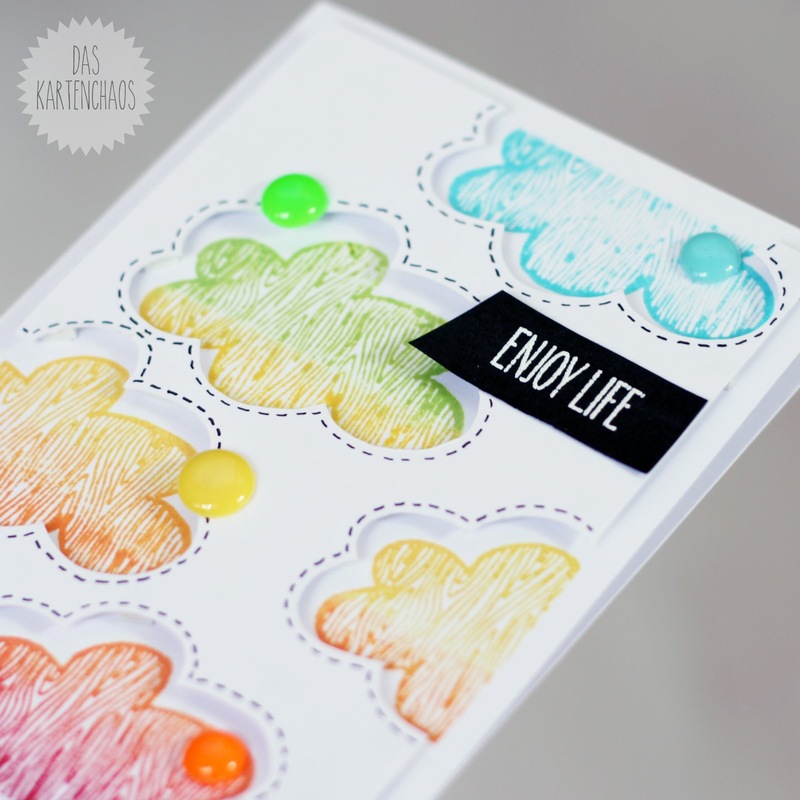 I totally fell in love with the new Clouds Stamp Set - it's fun and graphic and can also be used for cute cards. Versatile to the max! For my card I wanted to use one of those clouds to create a rainbow of clouds. To add some more interest I decided to stamp in the negative space and tried out to create a gradient with my dye inks. I know this is possible with pigment inks, but most of my inks are dye inks, so I had to give this a try. Don't forget to check out our pinterest-boards to find TONS of inspiration for your Neat & Tangled stamps. Where else do you get your inspiration from? Please let us know? Ssssssht.... Neat & Tangled will be selling coordinating dies to their stamps soon... so be sure to check back on June 16 to find out more. Exciting things are coming our way! This is sooo CUTE! Love the clouds! This is way too cute and colorful! Fun fun fun card! LOVE this card! 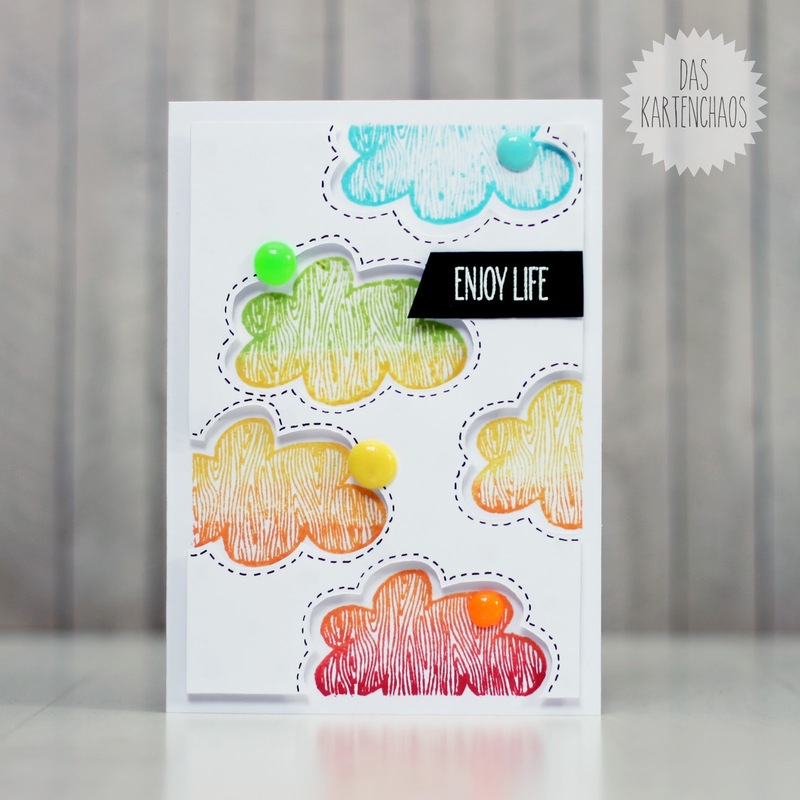 Love the negative piece you created and the gradient and the stitching details, so sweet! Love this card, it is so pretty, and thanks for the video!!! Such a simple idea, but such an effective card! I love watching your creative process, Christine. Did you say those were hand-made dots? awesome! I loved watching you experiment! And YAY for matching dies, because I would never had the patience to cut all those out! love your card, I am on my way to subscribe to your channel now! Your accent is very nice!